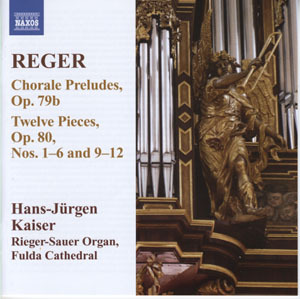 The Naxos Reger organ music cycle must be approaching completion if it has reached volume 11, not that it has been a cycle in any integrated sense, using as it does different organs and different organists throughout. Even so, it is an admirable endeavour, and even though Reger struggles to find an audience in the English speaking world, respect for his music among organists runs high. The programme here is made up of two sets, ten of the Twelve Pieces Op.80 and the Thirteen Chorale Preludes Op.79b. 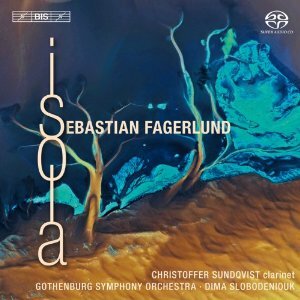 Opus numbers in the high 70s and low 80s place these works around the beginning of the 20th century, which for most of his composition was a period of dense counterpoint and experimental harmony. But there is little of either here. All the works on this programme appear to have been written for liturgical use, and (unlike Messiaen) Reger has no intention of challenging the musical tastes of the congregation. There is chromaticism in the sense of chromatic descents in the pedals and chromatically ascending sequences, but that's not the same as atonality as such. Even so, just because the music is comfortable, that doesn't mean it is uninteresting. Reger's flair for counterpoint is everywhere apparent, and he has a remarkable feeling for what works well on the organ, to the extent that not a single note seems wasted. Reger only specifies the registers he has in mind for each movement, rather than prescribing specific stops. Perhaps he is assuming that, given the gentle character of most of this music, the organist will play it safe. That is certainly what happens here. There are occasional loud moments, like at the end of Op.79b No.11, but even here the choice of stops is quite conservative in terms of the round sounds they all produce. A little more contrast would have been nice in the Chorale Preludes between the chorale theme, usually in the right hand, and the counterpoint. Reger isn't Bach, much as he tried to imitate him, and great as his counterpoint is, it occasionally needs a helping hand. The Rieger-Sauer organ in Fulda Cathedral is an older and creakier machine than you'll usually find on organ recordings these days. It is also a huge instrument, and the registration list takes up two pages of the liner. It has some elegant colours, which are occasionally put to good use, but this music would be equally suited, perhaps better suited, to a smaller instrument. The organ has also caused the recording engineers some problems, and many of the registers seem strangely distant, as if they were hidden away at the very back of a huge organ case, with no possibility of getting a microphone close. There is little extraneous resonance from the church, which is a plus, but even so the organ sound lacks clarity. Does Reger's organ music deserve better than this? Many would say that if you don't like the recording, the composer is much to blame as anybody. Even so, a little more precision and clarity would make all the difference with many of these short works. Most of this music is well conceived and expertly written, but it is going to take a recording with more impact than this one to win the composer many new converts. 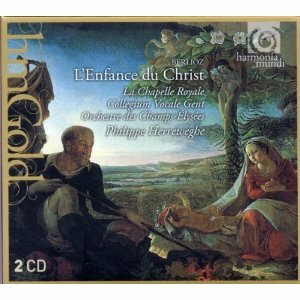 As you might expect, Herreweghe's account of the Christmas Oratorio is as authoritative as any. His orchestra and choir are lively but always precise and his soloists all excel. But most impressively, Herreweghe is able to marshal his impressive forces to create a whole that is greater than the sum of its parts. 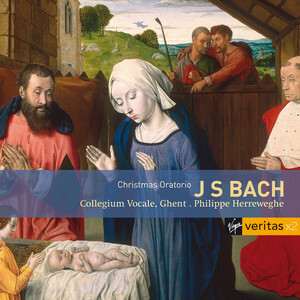 The Christmas Oratorio isn't the most coherent of Bach's works, but Herreweghe brings it all together, not so much by imposing architecture as by maintaining the flow of the music and not letting any single movement stand out too much from its surroundings. The general mood of this performance is surprisingly relaxed. Even from the outset, the solo timpani in the opening bars sound curiously flaccid, and the orchestral and choral textures that follow are warm and round rather than punchy and focussed. The use of such a large choir in a period performance is unusual, but their precision and agility more than justify the numbers. The number of orchestral players is not given, but the string section also sounds relatively large. The wind soloists put in some great performances, but Herreweghe always makes sure that the obbligato lines are subservient to the solo voices. Marcel Ponseele plays first oboe, and with more restraint than on Kuijken recordings. He also spends a fair proportion of the work playing oboe d'amore, and it is great to hear a virtuoso performance on that unduly neglected instrument. The vocal soloists form a well-matched group. In keeping with this relaxed performance, none is required to take anything to excess, giving the recitatives, and especially the arias, an almost conversational feeling of flow. The lion's share of the vocal work goes to Howard Crook as the Evangelist, and his light but characterful voice is ideal for the part. He often introduces solo numbers by the other singers, and each time, the timbral similarities between them make for an almost seamless transition. In any other context, these vocal performances could be criticised for lack of power and projection, but here the performances are ideal. Fans of Michael Chance and Peter Kooy might want to track this recording down for their performances. In 1989, both men were at the hight of their powers, and Herreweghe makes sure he gets the best from both of them. So why the relaxed tone in so much of this music? Well, by reducing the musical drama, Herreweghe is able to present the Oratorio as a more coherent entity. Also, the continuously celebratory major music that makes up so much of the work can get monotonous when presented in more boisterous recordings – introducing a sense of intimacy and poise creates more variety if nothing else. The recording also cleverly counters a range of stereotypes about the period performance movement. The idea that such ensembles are always small, always play fast and always go for spiky, angular sonorities, is countered by every aspect of this recording. The choir and orchestra are large, the tempos are relaxed, and the sound is warm. Herreweghe has plenty of austere period performance recordings to his name, but he is clearly open to other ideas as well. Johann Ludwig Bach, the so-called "Meiningen Bach" was a second cousin to J.S., who rated his older relative's works and performed many of them at the Thomaskirche. C.P.E. would later lament that his Thuringian ancestors had never sought audiences for their work outside of their small provincial towns, which may explain why so few of their works have survived. On the strength of these works, Johann Ludwig was clearly a major talent. Parallels with Johann Sebastian are everywhere, from the subtle orchestration to the varied use of liturgical genres and styles. The musical discourse is slightly more straightforward, there isn't the same fluidity of counterpoint, nor the subtly of harmony. Even so, you wouldn’t mistake anything here for Buxtehude or Pachelbel, it is all more sophisticated than that. The three discs give us a varied range of liturgical styles. The first is given over to the Funeral Music for Duke Ernst Ludwig, a varied and surprisingly upbeat service. The second is devoted to a series of motets, which closely mirror, or rather pre-empt, those of J.S. The third disc begins with a mass setting on "Allein Gott in der Hoh sei Her", a curiously Lutheran concoction, despite the Latin words. If anything, the mass sounds like a cantata, so the fact that it is followed by three cantatas seems all the more appropriate. The performances are good, and really work to the benefit of the music. Johann Ludwig doesn't write taxing solo parts in the way that J.S. later would, nor does he give us independent wind obbligatos, preferring to use the orchestral forces to introduce and double the singers. That is not to say the the orchestration is uninteresting, but it does mean that few of the vocal or wind soloists get a chance to shine. One exception is soprano Maria Zadory, who has a few showy arias on the cantata disc. She uses more vibrato than I'd normally associate with baroque repertoire, but it never seems excessive. The recordings were made in 1993/4, suggesting that this may be a reissue, although no clue is given in the liner. The sound quality is good, although the choir can sometimes sound a little distant. 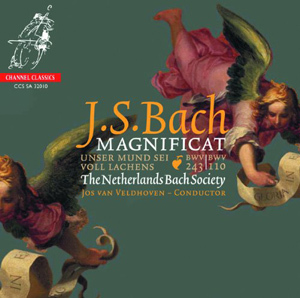 Given the generally homophonic nature of this music, both the performance and the sound engineering needs slightly different aims to those of a recording of Johann Sebastian. So things are more rounded here, with less attention to the minute details. When there is counterpoint in the choir or orchestra, and there occasionally is, you have to listen out for it a bit more, but that is no great hardship. All round, an interesting and enjoyable set. I'd previously been sceptical of the quality of the music by Bach's ancestors, but it turns out some are more interesting than others. If, like me, you have ever got bogged down in the turgid strains of Johann Christoph Bach, rest assured that this music is much more interesting and varied. Not quite up to the standards of Johann Sebastian, of course, but the family resemblance is unmistakable. Why is it that Berlioz works so well on period instruments? A wide range of period instrument approaches to his work is available on disc these days, from the relative austerity of Norrington at one extreme to the lush Romanticism of Herreweghe at the other. I suspect that Berlioz' mastery of orchestration is the answer. The notes fit the instruments so well, especially the grainier sound of 19th century instruments, that interpreters have plenty of room for manoeuvre when it comes to putting their own stamp on the results. Herreweghe goes for warm, round sounds throughout. His orchestra and choir are relatively large, but this never threatens either the ensemble or the intonation. It is not immediately obvious that this is a period instrument performance, such are the tone colours and the general openness to expression. But the lack of vibrato in the strings and the nasal quality of the horn sound soon gives it away. The woody sound of the bassoons and the focussed trombone sound are also highlights of the orchestral playing. In fact, the period instruments allow Herreweghe to achieve an ideal balance between the pastoral and dramatic elements of the score. He doesn't need as much volume in the louder passages to put the drama across, so everything fits more easily into the small-scale cantata format than it otherwise might. The singing too is intimate and approachable throughout. The lion's share goes to Paul Agnew, who does a brilliant job as the reciter. The clarity of his diction is ideal, and his French pronunciation is so idiomatic that you wouldn't believe he is the only soloist in the lineup who is not a native French speaker. The choir are also on top form, and despite the large size of the vocal ensemble, all their choruses and carols have an endearing sense of immediacy. The quality of the recorded sound is a significant factor here. The recording was made live at a concert in the Stravinski Auditorium in Montreux in 1997. Presumably the choir was at the back of the orchestra, but the placement of the microphones is ideal for them and for the rest of the ensemble. Again, the proficiency of the orchestration is an important help in the clarity and coherency of the sound, but the quality of the engineering must be just as important in achieving the result. The release is a reissue on Harmonia Mundi's hmGold label. As ever, HM strive for the highest production standards, even for the re-release market. So the packaging is handsomely furnished with some elegant illustrations, a full list of performers and a libretto in French, English and German. I don't think they have had to change very much from the packaging of the original 1997 release, yet the result feels impressively contemporary. Just one grumble about this and other recent volumes of the hmGold reissue series – it is difficult to tell from the packaging that it even is a re-release. The word "Gold" is the give-away, but finding any other information takes some detective work. The date and location of the recording are only given on the back cover of the liner and only in French, and there is no information at all about the original release. Obviously, there are important sales motivations behind this conceit, but it is not necessary. The recording is excellent, and at this price is undoubtedly a bargain. The fact it is 14 years old and has been released before shouldn't put anybody off. Considering this year is the 200th anniversary of Liszt's birth, there have been surprisingly few recordings of his music appearing. Of course, most of his piano works have long and venerable history on disc, but interpretation is such a key element with Liszt that any interesting new recording is worth seeking out. 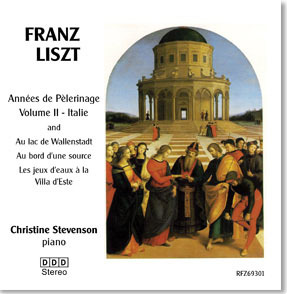 That is certainly the case with Christine Stevenson's new recording of the second year of the Annees de Pelerinage. Unlike many of her predecessors, she is not one to go to extremes to ensure that her readings stand out. Instead, she distinguishes herself though attention to the details and through an insightful approach to dramatic structure. When you first hear Sposalizio, you may think that the interpretation sounds ponderous and even pedantic. But a little patience reveals that Stevenson is building up both the emotion and the dynamics. This is an excellent approach with the Deuxieme Annee, as the set starts off in a relatively cool mood and then gradually builds up to the monumental Dante Sonata that forms its conclusion. Liszt's innovative forms are usually open to criticisms of poor structuring, but Stevenson demonstrates that if his works are performed with a keen sense of the dramatic scope, both of each movement and of the album as a whole, his work can make perfect structural sense. Even so, if you are looking for real fireworks, this might not be the interpretation for you. Even in the Dante Sonata, dramatic as the performance is, there is rarely the sense of sheer danger you feel with some pianists. But to my ear, the attention to detail more than makes up for this. Curiously, the middle register of the piano sounds slightly muddy, while the upper and lower ends are always perfectly clear. However, all the details remain as clear as you could want. Stevenson's restrained pedalling ensures that an ideal balance is achieved between the clarity of the individual notes and the line of the phrase. With the notable exception of the Transcendental Studies, very few of Liszt's piano albums fill a CD, making appropriate choices of filler a perpetual headache for pianists and record labels. Stevenson opts for a few selections from the first and third years: Au lac de Wallenstadt, Au bord d'une source and Les jeux d'eaux a la Villa d'Este. These too are clearly articulated and well structured. They do seem like afterthoughts though, especially after the imposing Dante Sonata that precedes them. Presentation wise, this disc scores very highly. Raphael's Sposalizio makes appearances on the cover and on the disc itself, and there is also an elegant portrait of Liszt from Henri Lehmann inside. And with the exception of those minor problems with the piano's middle register, the recorded sound is very good indeed. I hear that Potton Hall is up for sale, although I may be a little behind with that story. Whichever way, the clear but radiant sound that the hall imparts to the piano here demonstrates exactly why the venue is worth saving. 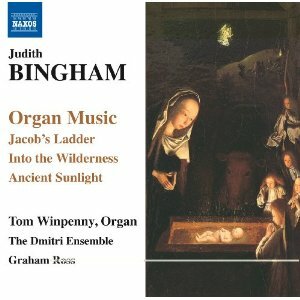 The old adage that all music has its roots in singing is clearly demonstrated in the work of Judith Bingham. She has a background in choral singing herself, and choral composition is a central part of her catalogue. But her instrumental works also have close links with the human voice, as this organ music demonstrates. Many of the works seek meditative stillness through quiet held chords, but even here a rigorous structure of voice leading keeps the music flowing and coherent. And the suggested registrations err towards the open diapason sounds, all the better to bring out the inherent vocal qualities of the organ's character. That said, the stand-out work on this disc, the mini-concerto Jacob's Ladder that opens the programme, explores instead the timbral relationships between the organ and a small string ensemble. But the approach is more to bring the strings close to the organ than visa versa. Double bass harmonics mingle with the higher partials of some of the organ registers to created subtle blends of sound. Pizzicatos are used to add attack in places, but there is never any sense of competition between the soloist and ensemble. All the other works on the disc are for solo organ. The liturgical basis of most of the music is evident, not least from the very direct relationships between the religious titles and the sound-worlds that each piece evokes. Most of the music is relatively quiet, but there is plenty of variety here. Bingham often uses repeated note accompaniments to move the music along, a logical but distinctive device. The liner tells us that Bingham's main inspirations for organ writing have come from France: Couperin, de Grigny, Widor and Alain. The latter is particularly evident in many of these meditations, but Bingham never indulges in the more perfumed Catholic indulgences that characterise so much French organ writing of the 20th century. One name that is notable by its absence on the list of influences is Messiaen, and it is refreshing to hear recent organ music that manages to escape his overbearing influence. Tom Winpenny is a sympathetic and imaginative interpreter. As Assistant Master of the Music at St Albans Cathedral, he knows its organ as well as anybody. He chooses his registrations well, presenting an impressive array of colours, despite the restraint required in playing generally quiet music on a huge organ. And the organ itself is in fine voice, this one of the first recordings to have been made on it since the comprehensive renovation work in 2009. Naxos have done another great service here to the cause of contemporary organ music. Their usual combination of no-nonsense packaging but with detailed commentary is as welcome as ever. Many of the works take inspiration from the visual arts, and it is a shame that none of the paintings on which individual pieces are based have not been reproduced in the liner. That's not Naxos' way, of course, but if there was any reason to consider taking the project to a different company, this might be it. Carl Maria von Weber's orchestral overtures make for a mixed but enjoyable programme. They don't all have operas associated, but even the ones that do date from a period when an overture was expected to stand on its own musical merits. The most famous of them, Freischutz, Oberon and Euryanthe, need no introduction, and most of the others are in a similar vein. They are all light, but occasionally dramatic, well orchestrated and structured with enough panache to ensure none outstays its welcome. Two of the overtures seem slightly distasteful, at least to my ear. The chinoiserie of Turandot, all pentatonic scales on flutes, is crass to say the least. Apparently Stravinsky rated this overture, but then he wasn't above cheap Orientalism himself, as his opera the Nightingale amply demonstrates. Then there is the appallingly jingoistic conclusion to the Jubel-Ouverture. If you don't know what is coming, I won't spoil the surprise, nasty as it is. As it's name suggests, the Tapiola Sinfonietta is a chamber orchestra. 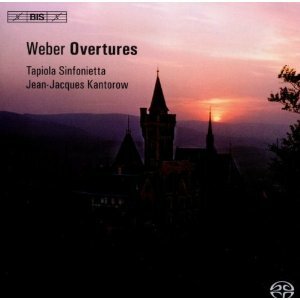 It is probably about the size of orchestra that Weber himself would have known, although it is worth bearing in mind that this is not a period performance ensemble, and Kantorow locates the music firmly in the Romantic rather than the Classical tradition. That doesn't mean that he takes undue liberties with rubato, but he is not overly strict either. And he is happy for the orchestra to punch above its weight in the tuttis, which is great, especially as the players keep in firm control of their sound production even at the loudest dynamics. A few more desks of strings would have been nice, but the balance between the strings and wind never suffers. The sound quality is excellent, even by the superior standards of BIS. The famed acoustics of the new Tapiola Hall must play a part in this clear but vibrant sound-scape. If the company didn't insist that their recordings are made without undue post-production jiggery-pokery, I'd have sworn that the bass had been artificially amplified. As it is, I'm happy to put the clarity of the trombones, lower horns and double basses down to the players and the acoustic. This solid bed of bass is what prevents the relatively small orchestra from ever sounding weedy. This is an old fashioned disc in some ways. You don't often find collections of overtures in the catalogues any more. And Jean-Jaques Kantorow excels at the old fashioned musical values of drama, intensity and involvement. 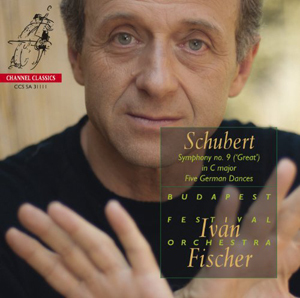 I have to confess that I can't hear the Freischutz Overture without thinking of Carlos Kleiber, and while Kantorow is aiming for a similar reading, it is no discredit to him that he doesn't quite manage it. In fact, the disc is an excellent combination of the old and the new – old fashioned musical values and up to the minute technology. 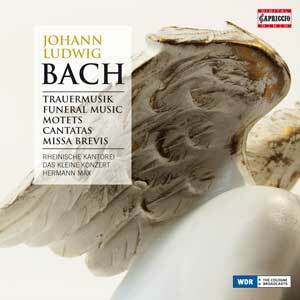 An enjoyable disc, likely to be of great interest to Weber fans and to audiophiles.